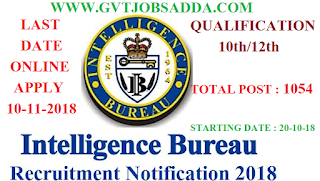 Intelligence Bureau recruitment 2018 : Recently INTELLIGENCE BUREAU (IB) has published security assistant executive vacancy notification on 19-10-2018, for 1054 posts, staring date of Intelligence Bureau recruitment 2018 apply online 20-10-2018,Those candidates who are interested & eligible for the security assistant executive posts, they can visit official website of Intelligence Bureau and apply online before last date of apply 10-11-2018. 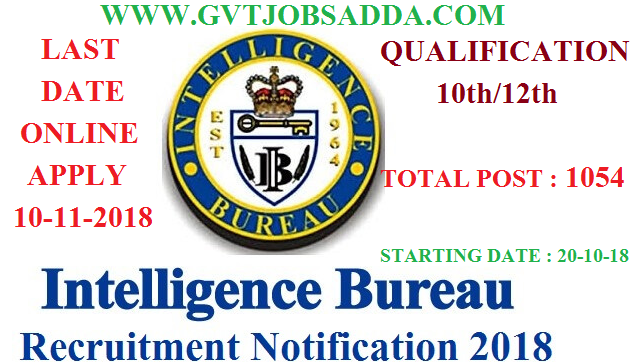 Brief information has given below interested candidates may check and apply before last date,best of luck. Desirable : Field experience in Intelligence work.